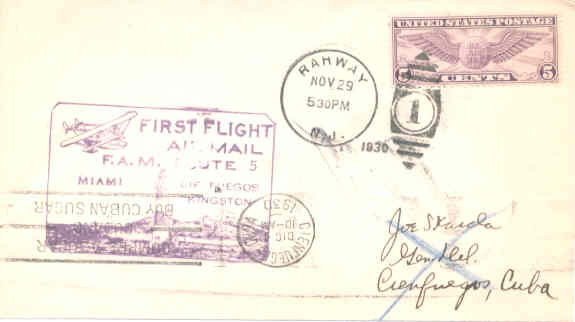 50056 - First Flight Cover- Nuevitas-Miami, Dec 6, 1931. PMK "Nuevita y Camaguey/ AMBU". 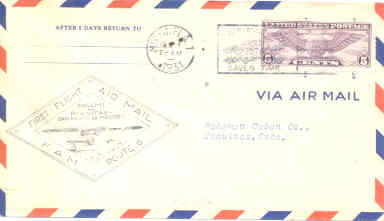 Corner card "Pan American Airways, Inc. Prado 13, Havana.Cuba. 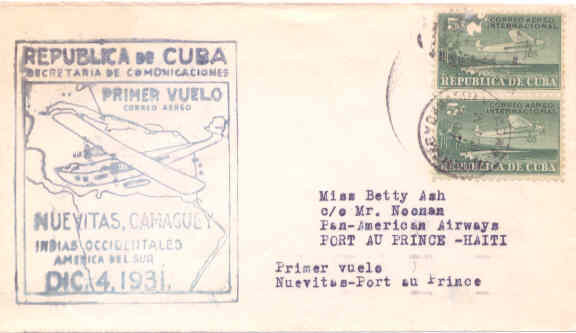 50060 - First Flight Cover-Santiago de Cuba-Holguin. Oct 31, 1930. 39335 - FFC- Edifil E115 Nuevitas-Miami, Dec. 6, 1931. 50,00 Euro. FFC: Edifil E62, FAM No 6 Camaguey-Saint Thomas. 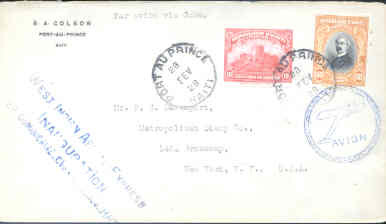 Postmarked at, Habana, Camaguey and Saint Thomas. 8 pieces flown (very rare). No priced. Nuevitas-Port au Prince, Dec 4, 1931. Edifil E102, 100e. Philately, FFC: Santiago de Chile-Habana. Jul 17, 1971. Blue Cachet. 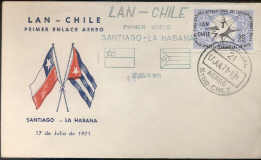 Philately, FFC: Habana-Santiago de Chile, Jun 26, 1971. Cubana. Cachet. 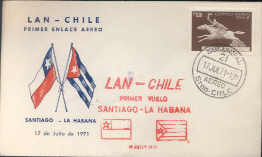 Philately, FFC: Santiago de Chile-Habana. Jul 17, 1971. Violet Cachet. 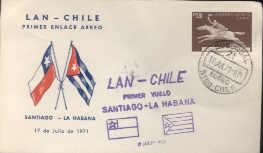 Philately, FFC: Santiago de Chile-Habana. Jul 17, 1971. Black Cachet. 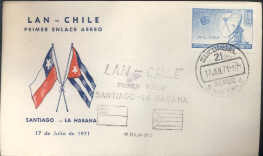 Philately, FFC: Santiago de Chile-Habana. Jul 17, 1971. Red Cachet. 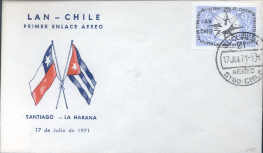 Philately, FFC: Santiago de Chile-Habana. Jul 17, 1971. No Cachet.